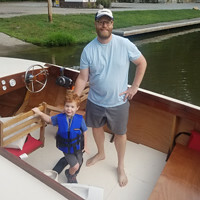 I am building a 11 foot skiff (figure 80 lbs for boat weight plus 450 lbs people and gear) as a hobby and am trying to determine if I should use an electric trolling motor for propulsion or a small gas outboard. Boat will be used in reservoirs and the odd small river. I see 56 and 86 lb thrust salt water trolling motors exist and it would seem that if a motor is strong enough to propel a small craft in slat water tides at speeds great enough to troll it might work good for "putting" around the local reservoir. That being said, I am very ignorant regarding what is practical. No matter how many pounds of thrust an electric trolling motor will only top out at about 5mph. So if you want to go that direction you might as well get a 30 or 40 lb thrust motor. An outboard sized appropriately would possibly get you on plane if the hull is capable of holding an engine with enough power. Thanks. I am very ignorant on this topic. Why is that? A trolling motor is designed for low speed, relatively low RPM. More lbs of thrust is only necessary to move a larger, heavier boat but won't make the prop turn faster. If all you want to do is tool around at a walking or slow running speed a small trolling motor will definitely do the trick.